If you like gettin’ down and dirty with the Kiwi, here’s a setup that might interest you. 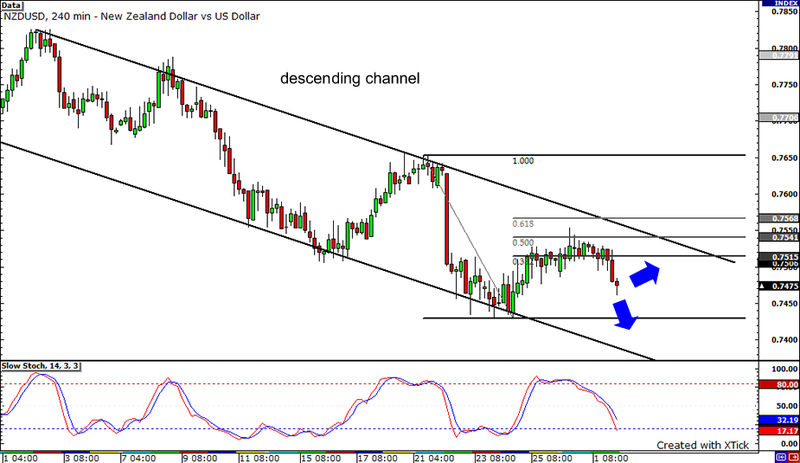 NZD/USD’s downtrend still seems to be very intact since that descending channel on the 4-hour chart is still holding. After bouncing from the bottom of the channel, the pair pulled back to the 50% Fibonacci retracement level before heading back down. Stochastic is still pointing downwards, which means that Kiwi bears have enough energy to take the pair lower, possibly until the bottom of the channel again. 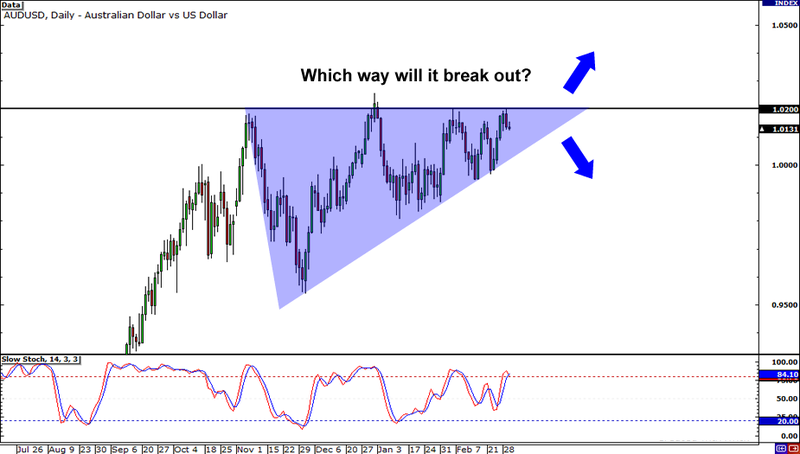 But if the bulls take over sooner than expected, they could push NZD/USD to test the resistance at the top of the channel once more. Now this setup ain’t one you’ll want to act on right now, but give it a couple days or so and it’ll be ripe for the picking! 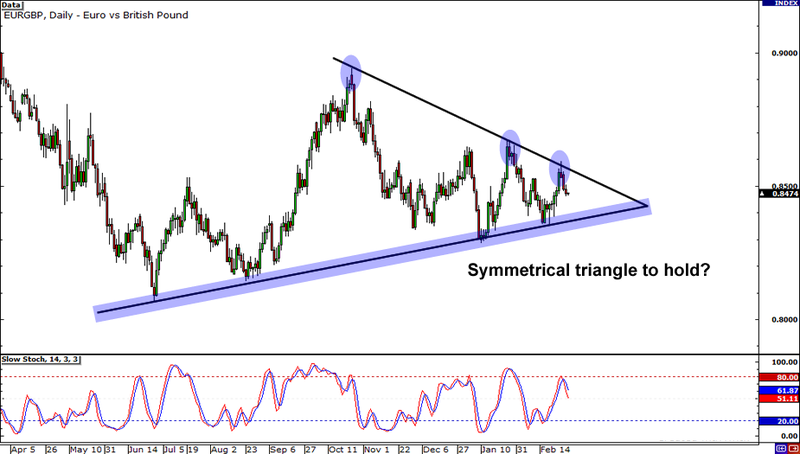 After bouncing off the symmetrical triangle‘s falling resistance, it looks as though the pair may encounter support soon. The rising trend line is only about 100 pips away now. When price reaches that level, you’d better get ready to act! Bullish candlesticks in this area could be a sign that the pair will continue zigzagging within the triangle. On the other hand, a bearish marubozu closing below the rising trend line could be the start of a huge breakout. The ascending triangle is still intact, baby! I mentioned this setup a couple weeks ago, and so far, it’s still valid. The pair’s range has gotten tighter and tighter over the past few days, which could be an indication of an impending giant breakout! The question is, which way will it break?? Ascending triangles following an uptrend, as in this case, are usually bullish continuation patterns, so the bias is towards an upside breakout. However, 1.0200 has been a stubborn resistance level, so we can’t rule out the possibility that the pair may give way to selling pressure and break to the downside.